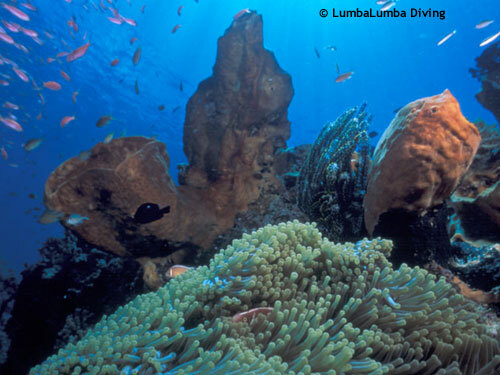 Lekuan 1,2 and 3 are the names of several marked dive sites along one of the best and steepest walls in Bunaken National Park. Big pelagic as tuna, jacks and sharks at Lekuan 1. Turtles, rays and Napoleon wrasse at Lekuan 2. Huge schools of batfish and midnight snapper at lekuan 3. Butterfly fishes, fusiliers, sweetlips, angelfishes, basslets, you name it - it is there. Overhanging cliffs, caverns, niches are all covered richly with corals, anemones, sea fans, featherstars and sponges. There is some great snorkeling, also at the reef flat, with lots of macro stuff. Lekuan Two and Three are normally mild with currents, but Lekuan One can at times be a real challenge.